Want to know what I would say is the most valuable part of your reading and writing workshop? What's a Share Chair, you ask? A Share Chair (also known as the Reader's Chair and Author's Chair in my classroom) is a special chair that I invite my students to sit in while sharing something about their reading or writing. During the last 10 minutes of our workshop, 2-3 students would be selected to sit in this special chair to talk about a skill or strategy that they tried on their own during independent work time or even just to share a portion of a story that they've written or read. Let's first talk about the chair itself. It need to be F-A-N-C-Y. Keep an eye out at garage sales or thrift stores for a wooden chair like this that you can transform into a Share Chair for your classroom. Now that we understand the importance of how your chair looks, I'm going to walk you through how to set up this special time in your literacy block so that it can be the most valuable portion of YOUR workshop. I already mentioned that using a Share Chair in your classroom could be one of the most valuable parts of your workshop. That's because, it is during this time that you'll really get to see if your students "got it." You'll also get to witness some of the most meaningful interactions between your students. 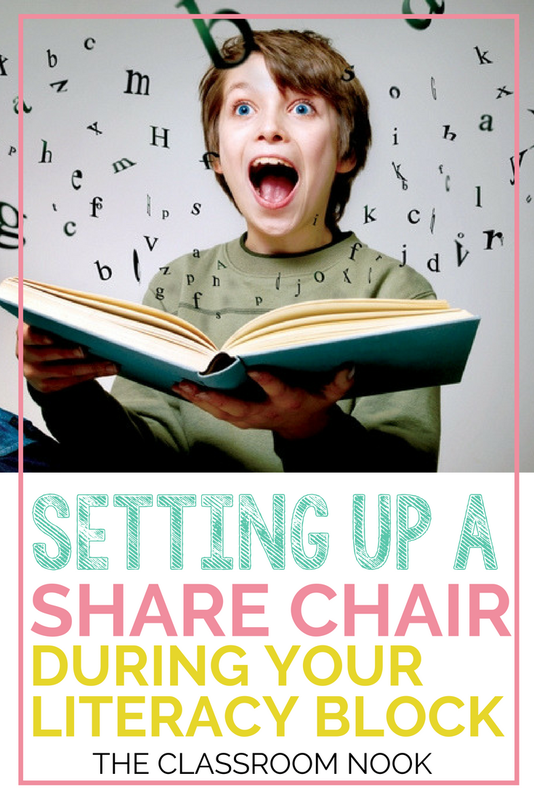 To get started, you'll need to decide how often you will use the Share Chair in your classroom. For me, it was every Friday. Of course there was the occasional spontaneous Share Chair time when I wanted a student to share something that just could not wait, but as a general rule, we used it once a week. During our weekly Share Chair time, I would pre-select 2-3 students. Our class had a schedule of who would be sharing each Friday so that they could come prepared. It also allowed me to meet with any reluctant students ahead of time so that they could feel a little more at ease after we talked through what they would share. If time allowed, I would have an additional student or two share as well. These students would volunteer if they had something they wanted to share from their own reading or writing. What you allow your students to share during this time of your literacy block is up to you, however, I have found the most success with the Share Chair in my classroom when I gave students a specific point of focus for what they would be sharing each week. For example, if my writing mini-lessons during the week all focused on how to craft an engaging beginning to their stories, then the guidelines for the Share Chair time would be for students to share the beginning portion of their stories with the rest of the class. Giving sharing guidelines actually helps to keep this time at the end of your literacy block more focused, structured, and beneficial. Students can also use the Share Chair to ask their classmates for suggestions or feedback. This works particularly well for your writing block. Students can ask for advice on word choice and vocabulary or even on how to end a story. Think of the meaningful and authentic conversations that could take place! 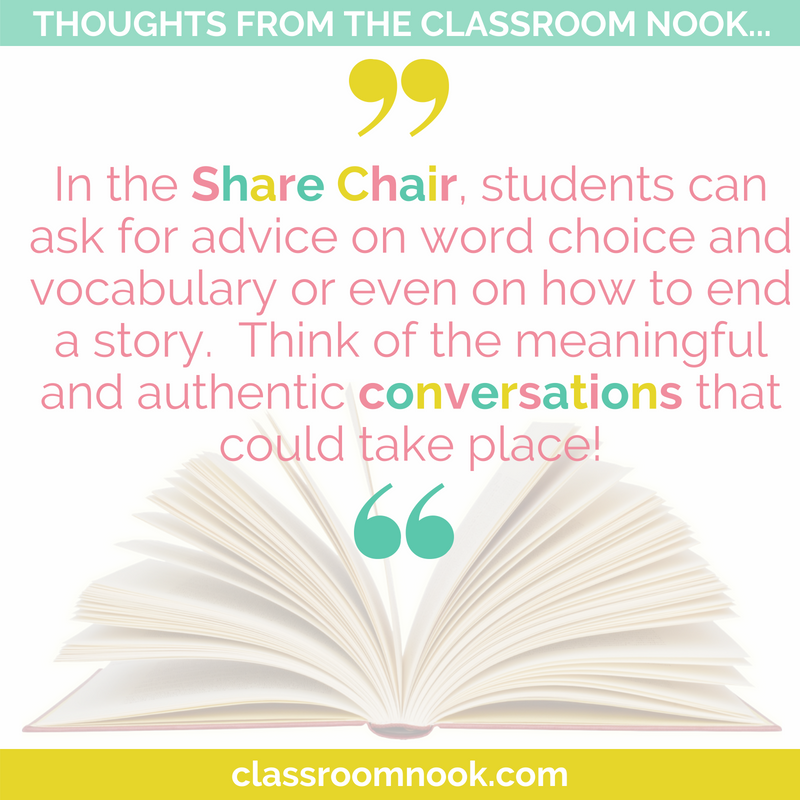 As important as it is to teach students how to share their reading and writing in the Share Chair, it is equally as important to teach students how to respond to their classmates who are sharing. I make it clear to students that this time should be centered and focused around the student sharing and is NOT a time to talk about their own reading or writing. I use the following guidelines for teaching students how to respond to others' reading and writing. You might find it helpful to have these guidelines written on an anchor chart near the Share Chair that you can go over at the beginning of your share time. Of course students are not required to use these prompts, but they did help students that are reluctant to share a response. Don't be discouraged if you hear crickets when it comes to sharing and responding at the beginning of implementing a Share Chair. Students will need time to warm up to the idea and get comfortable with sharing and responding to each other. Focus on modeling best practices for the Share Chair and the students will follow!